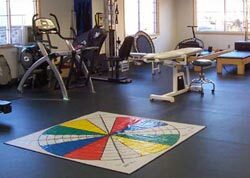 CSPT offers a wide spectrum of rehabilitative services to assist our clients in reaching the summit of their physical functional capabilities, whether that be in sport, work, recreation or just everyday life. Regardless of your diagnosis or injury, you can rest assured that our professional staff will provide you with a quality rehab program customized to your specific needs through an appropriate combination of therapeutic modalities, hands-on manual techniques, therapeutic exercise, instruction in proper body mechanics and posturing, and instruction in a home program to provide you with the tools to continue your healing process and prevent future symptoms. 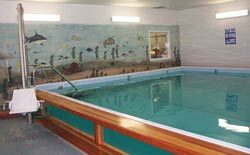 Our 24th Avenue location features a 20' x 25' warm water therapy pool for aquatic exercise therapy. The low patient to therapist ratio (1-2 persons per therapist) ensures optimum effects for your therapy. The water is kept at 88° to 92° F and the room temperature is kept at a warm 85°-92° F. The Therapy Pool is open from 8:00 am to 6:00 pm, Monday through Friday. Patients who have finished therapy can continue to use the pool for exercise on a fee basis, by appointment. The pool usage is limited to five people at a time to ensure maximum space for you to comfortably complete your aquatic exercises. Buoyancy: the "unweighting" effect of the pool allows people to perform some activities in the water that they may be unable to perform on land, such as walking for someone with comprised weight-bearing on their legs or someone with back pain. Resistance: the water provides a natural resistance to everyday movements allowing your muscles to become stronger. Hydrostatic pressure: the light pressure of the water against the body combined with movement serve as a natural way to decrease swelling and edema. CSPT will address these or any other injury that may be limiting your ability to participate comfortably in work, recreation, sport, or everyday activities. Our professional staff can assist you in achieving your best possible recovery from a sports-related injury. Your customized rehabilitation program will include sport specific training to get you back on the field of play as soon as recommended and keep you there. Additionally, therapists experienced in biomechanical assessment can provide you with information on what specific areas of your body may benefit from a combination of strengthening, stretching, and proprioceptive training. We want to assist you in improving your performance in sport, whether recreational or for competition, and help with preventing future injuries. CSPT has therapists specially trained in the treatment of vestibular disorders. Problems with dizziness can be relieved by learning the correct exercises to alleviate these symptoms. Controlling these symptoms will allow you to return to your previous level of activity while decreasing the worry of falling or becoming dizzy. We bill L&I, personal injury and most medical insurances when massage is determined medically necessary. On-site seated massage is available at your work place or gathering for 6 or more persons. Seated massage: $15.00 for 15 minutes. Massage Therapy and Gift Certificates are available at all locations. The Mulligan Concept is a manual therapy approach to restore functional motion and reduce symptoms. It utilizes gentle manual repositioning during active motions to promote optimal joint mechanics. Most of the techniques can be reinforced with home exercises and taping. For more information on Mulligan techniques and treatment, please visit the Mulligan website. This program is for the treatment of stress and urge incontinence by learning appropriate exercises to strengthen the pelvic floor muscles and regain control of your bladder. The Urinary Incontinence Therapy uses biofeedback to learn how to exercise the correct muscles and, as needed, electrical stimulation. The program can work with functional activities you may participate in where incontinence currently interferes. This is a treatment program that can help workers who have been injured recover by increasing their activity. Activity Coaching is standardized intervention delivered by professionals trained in the Progressive Goal Attainment Program (PGAP®). For more additional information please visit the Labor & Industries page on Active Coaching. When you walk in our door, we understand that you are trusting us to help you achieve improved physical function. We do not take that lightly. Our treatment staff is composed of highly qualified, licensed Physical Therapists and Physical Therapy Assistants who will be able to individualize your treatments to meet your specific needs. There is truly a difference.